In the 24 hours since President Donald Trump escalated an attack on Rep. Ilhan Omar by tweeting a video of her spliced with footage of the burning twin towers, Democrats have accused him of Islamophobia, inciting violence and politicizing one of America’s gravest tragedies. The swift condemnation started Friday afternoon, after Trump shared the video with his millions of followers, along with the caption "We Will Never Forget." 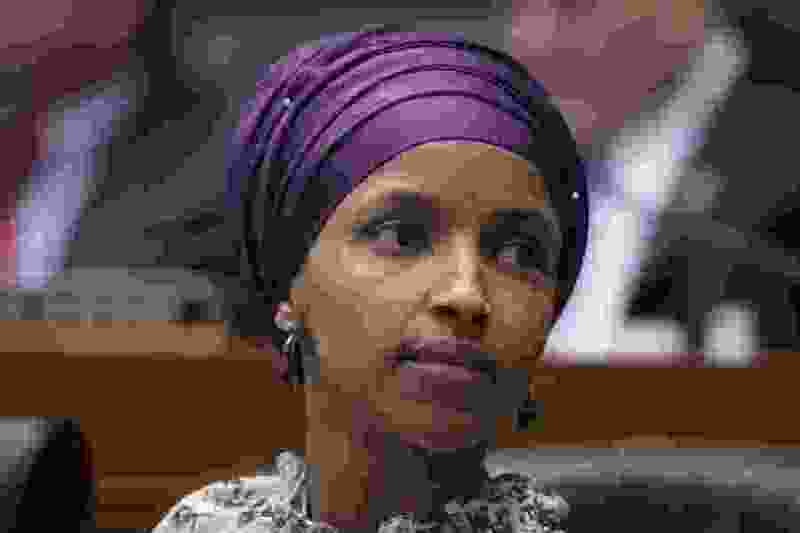 Omar, D—Minn., a Somali refugee who made history as one of the first two Muslim women elected to Congress last year, has been the target of conservative criticism this past week, after right-wing media outlets began sharing comments she made about the Sept. 11, 2001, terrorist attacks to a largely Muslim audience last month. “For far too long, we have lived with the discomfort of being a second -class citizen and, frankly, I’m tired of it, and every single Muslim in this country should be tired of it,” she said. Sen. Elizabeth Warren, D—Mass., responded forcefully as well: “The President is inciting violence against a sitting Congresswoman — and an entire group of Americans based on their religion,” she tweeted. The president also has a long history of denigrating Muslims. He often suggested President Barack Obama, who is a Christian, was really a Muslim, insinuating that if he were that it would be a negative. In his race for president, Trump declared that "Islam hates us." He also formally proposed banning all Muslims from entering the United States during the presidential campaign. His administration has implemented policies barring citizens of certain Muslim—majority countries from traveling to the United States. "George W. Bush — I didn't have a lot in common with him. His views were very different than mine," he told the crowd. "But remember what he did after 9/11? He walked into a mosque to say that criminals, terrorists, attacked the United States. Not the Muslim people. That was a conservative Republican. We now have a president who for cheap political gain is trying to divide us up." House Speaker Nancy Pelosi, D-Calif., didn’t mention Omar specifically in her comments. Instead, she focused on the president’s politicizing of the terrorist attacks. "The memory of 9/11 is sacred ground, and any discussion of it must be done with reverence. The President shouldn't use the painful images of 9/11 for a political attack," she said in a statement. "It is wrong for the President, as Commander—in—Chief, to fan the flames to make anyone less safe." Rep. Rashida Tlaib, D—Mich., the other Muslim woman in Congress, seemed to agree with a tweet criticizing Pelosi's statement for not referencing Omar by name. Before her congressional term had even begun, Republicans demanded she be removed from the House Foreign Affairs Committee because she had criticized the Israeli government and its treatment of the Palestinians. Then, Omar made two comments about U.S. support for Israel that ignited fresh controversy. Democrats and Republicans accused her of perpetuating anti—Semitic tropes. Pelosi and others condemned Omar's comments about Israel. Republicans, including Trump, have continued to use Omar's comments to try to paint the Democratic Party as anti—Semitic.